Hayden Farrar is a multi-instrumentalist, composer and educator with ten years of experience living in Toronto, Ontario. He first found is love of music through jamming on folk and rock songs while navigating high school in the small potato town of Alliston, Ontario. Since then however, he has completed his Bachelor of Music from Humber College with honours in 2014 and completed his Masters degree in performance at Berklee College of Music in 2016. 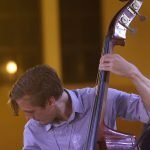 Hayden has been fortunate enough to perform and teach masterclasses and private lessons at jazz festivals in the Dominican Republic, Montreal and Panama. During the Summer of 2014 Hayden was accepted on faculty at the Global Music Institute in New Delhi, India for a semester where he taught Berklee core curriculum courses such as theory, ear training, ensemble and private lessons. As a teacher Hayden is capable of covering a wide array of genres that range from jazz, to folk/rock, to r&b to chamber music.